Sony confirmed in an "Access PlayStation" video published today that several PS4 functions will not require a PlayStation Plus subscription to use. Unlike the Xbox One, the PS4 won't require users to have a subscription in order to use party chat, play free-to-play games like Planetside 2, or use online apps like Netflix. Sony announced at E3 2013 that a PlayStation Plus subscription will be required to play PS4 games online. That was a big change, since the PS3's online gameplay features were free. It was Microsoft's consoles, beginning with the original Xbox, that always required a subscription to play online. That revelation raised several more questions about what Sony will and won't require a subscription for, and luckily those questions were answered in the video. Sony also revealed that the PS4 will "support 3D content" and that it will allow users to keep up to 2,000 friends on their friend lists. That's double the Xbox One's cap of 1,000 users. The company also confirmed that the PS4 will not be compatible with the PS3's DualShock 3 controllers. In addition we have discussion on the PlayStation camera, saying that it has four microphones for directional input and output audio and can recognize 3D space for augmented reality purposes. And the burning question: Exactly what shade of black is the PS4? 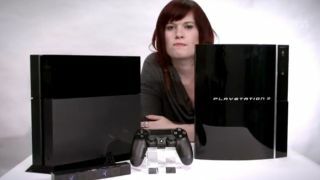 That's "jet black," for the record, compared to the original PS3's "piano black." In addition to allowing users to play online games on PS4, PlayStation Plus gives them access to early demos, discounts and free games, and other perks. Subscriptions are available at $17.99 (£11.72, AU$19.54) for three months or $49.99 (£32.56, AU$54.28) for a full year.